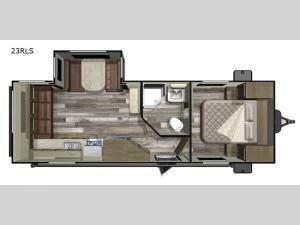 This Starcraft Mossy Oak 23RLS travel trailer allows you to make the most of your camping vacation. The electric awning with LED lighting keeps your nights going even after the sun has set. The convenience of a single slide with a booth dinette promotes extra space for moving around, and also converts to a sleeping space for one adult or two children. While the chef of your group is preparing their best meal in the kitchen, you can socialize with them while you relax on the sofa in the rear. Inside the front private bedroom, you will enjoy a good night's rest on the queen bed with closets and nightstands on either side. Plus, you even have access to the dual entry bath!